Antique Heriz Carpets Serapi Rugs and Persian Bakshaish Carpets – The carpets of northwest Persia are in a class of their own. Prized for their strong geometric style, fine construction and rich colors, the carpets of Heriz, Serapi and Bakshaish are regional cousins that share mutual origins. These northwestern districts were home to dozens of villages and niche communities tucked away in mountainous regions and plunging valleys. Together, these distinct settlements and isolated communities formed a strong carpet-producing network that has maintained its international notoriety centuries later. The distinctive northwest Persian geometry of antique Heriz Serapi and Bakshaish Rugs is one of many iconic traits that these regional creations share. The district of Heriz has always stood out for its aesthetically appealing antique rug creations. These elegant, softly colored and richly patterned carpets continue to attract new generations of consumers and collectors. Antique Heriz carpets are prized for their elegant patina and rich colors that are often attributed to the area’s copper-rich water. Regal terra-cotta reds, clear Persian blues and creamy accent colors are synonymous with the region’s unmistakable coloration. Weavers in Heriz used the finest wool and deeply depressed Turkish knots to produce durable, long-lasting carpets. 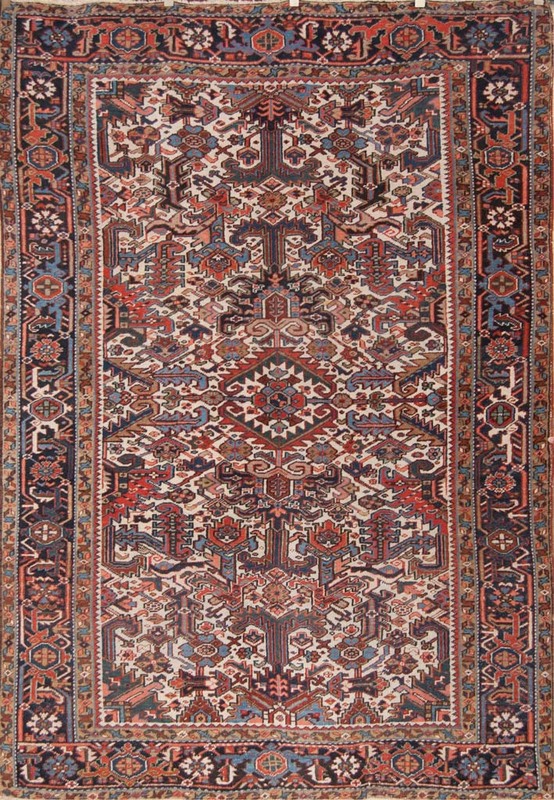 Antique Persian Heriz Serapi rugs have many of the same physical attributes as the famous iron carpets of Bidjar. Serapi Heriz antique rugs, which are attributed to the village of Serab, are considered to be some of the finest examples from this region. These elegant carpets feature strongly depressed Turkish knots, distinguished rectilinear patterns and angular interpretations of traditional Persian designs. While regional compositions in Serab and the greater Heriz region tend to favor broad armorial medallions and articulate botanical motifs, abstract rectilinear interpretations of arabesques and lush Persian florals are occasionally featured. Elegant repeating patterns, cascading willow trees and rustic vine-scrolls are used with greater frequency in Bakshaish carpets. These softer and aesthetically subtle carpets tend to incorporate gentle earth-tone colors and larger more tribal design elements. While Bakshaish is part of the Heriz district, the area is also closer to the acclaimed carpet-producing city of Tabriz. 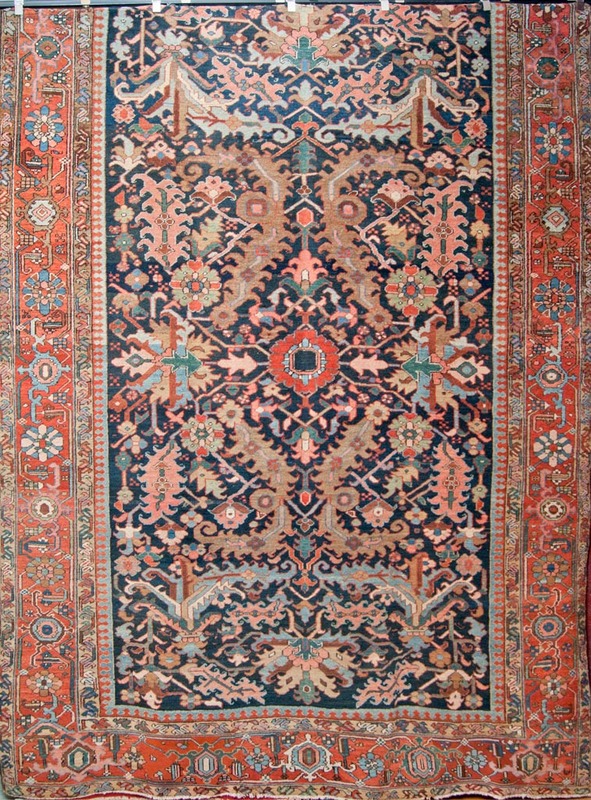 Antique Bakshaish rugs may feature sublime repeating patterns with cascading shrubs and refined cypress trees. However, grand medallions set over strong monochromatic spaces and camel-colored backgrounds are regional hallmarks that are inextricably associated with Bakshaish. The carpets produced in Heriz, Serab and Bakshaish are distinguished, iconic and elegant in a raw, unadulterated manner. These superficial traits and the impeccable physical construction have earned northwest Persian rugs an everlasting place in Western interiors.